As a professional Arboricultural company we are regularly asked many diverse questions in relation to trees and bushes, from planting, pruning, disease and storm damage through to their final removal. Below are a number of terms and processes (as per industry best practices) that may have to be looked at prior to and during any work being carried out. Please contact us if you have any questions that are not answered here, we are always happy to talk you through the work that we are suggesting. Tree pruning may be necessary to ensure a tree stays in a safe condition – to remove specific branches or stems to benefit the whole tree, to remove dead branches, to promote growth, to regulate size and shape or to improve the quality of flowers, fruit or timber. Improper pruning may lead to trees becoming unsightly, diseased and/or potentially dangerous. Natural features of a fork or union that may or may not be visually obvious. Neither the branch bark ridge nor collar should be cut. Crown lifting removes the lowest branches, or sections of the lowest branches, to give a uniform height from ground level. Trees are often crown lifted to increase light levels, improve views and give greater access for vehicles. Crown thinning can improve light levels and the amount of shade cast by the tree. A Good Rigging Control System (GRCS) is a tool for working with large timber. 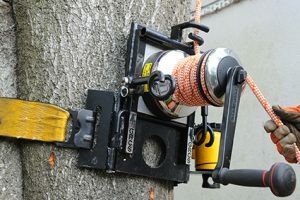 The winch attaches to the trunk and helps lower heavy wood with control and safety. A Mobile Elevating Work Platform‘ is a mobile machine which consists as a minimum of a work platform with controls, an extending structure and chassis; that is intended for work at height. Pollarding is the removal of all branches from the trunk to leave a standing pole. Re- pollarding is the removal of all new growth on a tree that has been previously been pollarded. Pollarding is common practice for trees in an urban environment such as street trees. Once started, it should be repeated on a cyclical basis always retaining the initial pollard point, or bolling as it becomes known. If you have an unwanted tree stump in your garden or want a tree completely removed. Stumps are ground into chips to a specific depth below the existing soil level using a specialised stump grinding machine. The stump grinder reduces the tree stump to a pile of wood chips mixed with the soil which can be left at the site of the tree/stump. TPOs are administered by Local Planning Authorities and are in place to protect trees that bring significant benefit to the local area. This protection is particularly important where trees are under threat. All types of tree can be protected and a TPO can protect anything from a single tree to all trees within a defined area or woodland. TPOs cannot be placed on hedges, bushes or shrubs. Please follow the link below to understand more about TPOs.